Bukit Jambul Condominiums Sdn Bhd is targeting expatriates, participants of Malaysia, My Second Home programme and corporate executives as potential buyers for its Hillcrest Residences condominium project in Penang. Its managing director, Datuk Lim Kong Wai, said among the selling points of the project will be its proximity to a golf course designed by Robert Trent-Jones, luxury bungalows and the five-star Hotel Equatorial Penang. 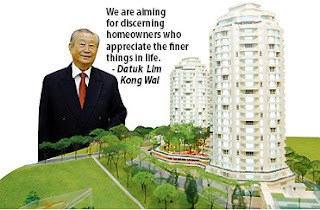 "We are aiming for discerning homeowners who appreciate the finer things in life," Lim told Business Times in an interview. The Hillcrest Residences, which carries a gross development value of RM120 million is sited on 2.16ha at Bukit Jambul, adjoining the Hotel Equatorial. The project's first phase comprises a tower with 79 units, while the second tower is made up of 79 units. The development is being marketed as a low-density, luxury high-rise project, due to the two residential towers which are spaced far apart and overlook a podium housing facilities which include a large free-form swimming pool, generous open spaces, gymnasium, dance studio, meeting room, playground, launderette, and tennis, squash and badminton courts. The developer combines the expertise of both the Hotel Equatorial Group and Lim Kah Ngam (M) Sdn Bhd. Lim is the managing director of both companies. Its third investor is Arishah Sdn Bhd, a company owned by the family of AmCorp Group Bhd chairman Tan Sri Azman Hashim. While Hotel Equatorial has carved a name in the hospitality industry, Lim Kah Ngam has a history spanning five decades in building Malaysian landmarks which include Hotel Malaya, the Australian Chancery in Kuala Lumpur, Bank Negara Malaysia, the Holiday Inn hotel in Johor Baru and the 65-storey Kompleks Tun Abdul Razak (Komtar) in Penang. "Since our soft launch two weeks ago," Lim said, "we have had a take-up rate of 20 per cent for Tower 1 of the project." He also said the project will be marketed via agent Henry Butcher Malaysia in Hong Kong, Japan, South Korea, Singapore and the Middle East, although parties from Australia and Scandinavia have shown interest. The first tower, podium area and public facilities are expected to be completed by the end of this year while the remaining components will be ready a year later. "We would like to offer the condominiums as golf resort homes for top executives of multinational companies," Lim said. Each residence boasts a floor area of 2,277 sq ft, while the penthouse duplexes are over 7,000 sq ft.
Datuk Lim Kong Wai: If you are aiming for expats, MM2H-participants and executives your marketing people should not advertise 5% discount to Bumiputras as in PSC's club magazine recently. It is terribly old fashsioned and more importantly totally discriminatory and therefore illegal. Stop that! Is Hillcrest set to become "the most sought after luxury address on the island" as claimed in your advertisements? I don't think so. Who want to live 6 minites from n airport? Take a look at some of the new developments in Tanjung Bungah. Low density (2 apartments per floor, right smack on the beach). That's what I call luxury. Good luck with the development. When is the website ready?